You are here: Home / Books / Reading in the Bathtub: One Woman’s Quest (a Book Riot cross-post). Reading in the Bathtub: One Woman’s Quest (a Book Riot cross-post). Today, I’m going to share one of the pieces I’ve published on Book Riot. We will return to our regularly scheduled book reviews next week. You’re in high school when you first decide that you’re going to combine two of your favorite things for maximum relaxation – reading and bubble baths. You don’t really think it through. Your glasses steam up and you get wet fingerprints on the pages of Robin McKinley’s Outlaws of Sherwood. You have nowhere dry to put your book down to adjust the water temperature. Your neck hurts from leaning on the edge of the tub. The experience fails to live up to your expectations. This time you have a plan. You wear your contacts. You roll up a towel to make a pillow for your head, and you bring the Rubbermaid stool from the kitchen to be a lap table, like when people in movies have breakfast in bed. The stool is unexpectedly buoyant; it doesn’t stay put over your legs the way you wanted it to. The towel soaks up water and slides wetly down your back. You notice, at close range, that the floating stool you’re now bathing with isn’t particularly clean. You are grossed out and uncomfortable. You surrender and decide to re-strategize. Your mom lets you borrow her waterproof bath pillow, and it’s just what you needed. You put the questionably hygienic (but now much cleaner) kitchen stool on the floor outside the bath to act as a table. You drape a towel across the stool for drying your hands. You line up your vanilla-scented Bath and Body Works candles on the radiator cover and light them for ambiance. You feel pretty good about yourself. The bathtubs in your dorm room and first apartment are questionable. The quest is put on hold. You live in a grown-up apartment now with your boyfriend. You clean your bathtub (somewhat) regularly. You have a Kindle, which is easier to manage in the bath with one dry hand. You’re reasonably sure the Kindle can’t electrocute you if you accidently drop it in the water. You also now drink red wine. You slip into the lavender-scented bubbles and settle in for bliss. You attempt to recline and immediately learn that you have the world’s slipperiest bathtub. It is slapstick, slip-‘n-slide style catastrophe. You spill your wine, but manage to toss your Kindle over the side as you go under. At Christmas, your parents present you with a waterproof bath pillow of your very own. Your sister contributes a selection of colorful, scented bath additives and the piece-de-resistance: a bath caddy that sits across the top of the tub. It is fitted with an adjustable book holder and two metal arms; one with a platform for a candle, the other with a metal swirl designed to hold a glass of wine. You have never seen anything so wonderful. You buy a non-slip mat for the bottom of your bathtub. You suction cup your waterproof pillow into position and adjust your bath caddy so that it won’t fall in. You place a eucalyptus-scented candle from Whole Foods in the candle holder and a giant plastic goblet of Cab Sav in the wine holder. You prop your Kindle in the book holder and place a folded hand towel on the side of the bath caddy to keep your fingers dry. You light the candle without setting anything else on fire. You climb in, add the bubble bath, and let the water run until the foam just kisses the bottom of your candle. It is perfect. You are never seen again. This post originally appeared on Book Riot on March 12, 2013. For more of my bookish writing, please check out my Book Riot author page. Haha – you’re a lady after my own heart, as always, Lydia. Thank you! 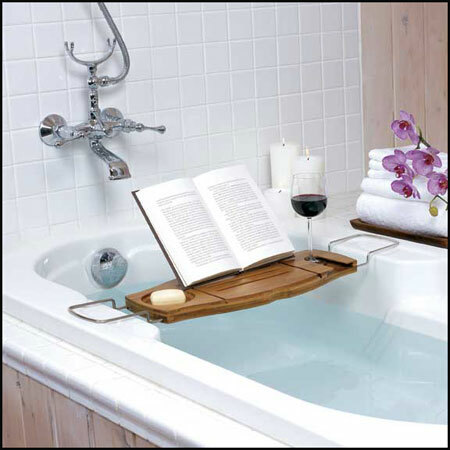 I think I’m just figuring it’s worth the risk: what use is a Kindle to me if I can’t read it in the bathtub? I love the idea of the foam acting as a cushion, though. Brilliant.